Real Madrid left the Vicente Calderón with a 2-1 defeat, but they went through to the final thanks to their first leg 3-0 win last week! The Colchoneros still had their hopes revived when they were 2 goals up soon in the 1st half, but Isco killed all their dreams after a brilliant play from Benzema. 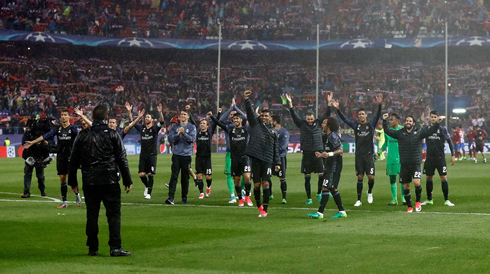 Real Madrid may have lost their first game in the UEFA Champions League this season, but they certainly walked off the pitch with a big smile in their faces, after beating Atletico Madrid with a 4-2 score on aggregate. 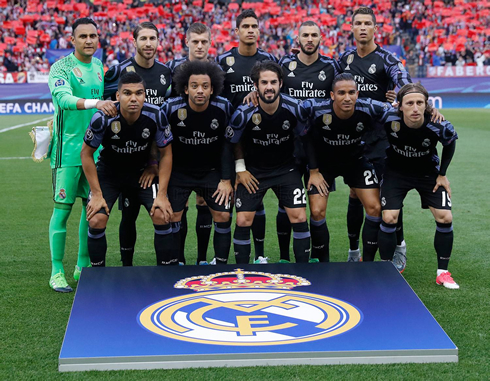 Zinedine Zidane's men will be on the competition's final on June 3 against Juventus despite tonight's 2-1 loss at the hands the Colchoneros, but they still got a big scare when they found themselves 2 goals down near the 15th minute mark. Fortunately, Karim Benzema seems to have left his magic touches to tonight's game and his spectacular dribble dismantled Atletico's defense to allow Isco to score a vital goal in this tie. 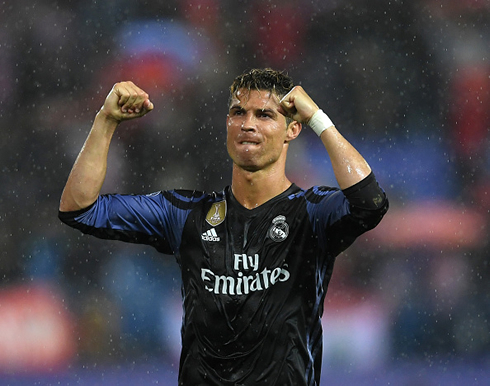 On the day, it was a 2-1 loss, but it didn't matter in the end, as Real Madrid have moved onto the UEFA Champions League final for the 15th time in general and the 2nd time in a row. However, it was a terrifying game at times for the Madridistas, as Atletico almost did the impossible. Leading 2-0 after a mere 16th minutes, Real Madrid looked terrified as their rivals played at 100%. It was an entirely different Atletico today compared to a week ago. They won every 50/50 ball and they put Madrid under tremendous pressure in the opening of the game. But Madrid secured a 3-0 win for a reason and Atletico still needed one more to force extra time. This is when Madrid's experience shone through. Led by Modric, Isco and Kroos, the midfield stabilized and relieved pressure on the defense. Slowly, but surely Madrid began to get control of the game and just before halftime, we saw the resurrection of Karim Benzema. Dribbling on the wing, the much-maligned Frenchman inexplicably dribbled past three Atletico players when seemingly left for dead in the corner. After dribbling past he centered the ball for Toni Kroos who's fantastic low shot was saved by Jan Oblak. But thankfully, Isco was there to tap it in. A massive goal! And the one that effectively ended the tie. 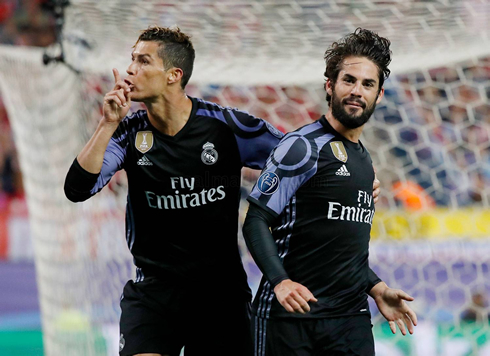 Ronaldo and Isco shushed the crowd as they sprinted off in celebration. Atletico now needed three more goals to qualify. Madrid looked far better in the second half, controlling the game and making smarter decisions. Eventually, the crowd began to die down and Los Merengues seemed to be very comfortable. Keylor Navas also deserves a mention, the Costa Rican shot-stopper was brilliant today stopping Atletico time and time again. A brilliant double save on Carrasco and Gameiro was his highlight of the match. But Madrid are moving on to Cardiff, where they will face a strong Juventus side. There are four finals left. Cristiano Ronaldo next game is a La Liga fixture on May 14 of 2017 against Sevilla. You can watch Juventus live stream, Real Madrid vs Sevilla, Middlesbrough vs Southampton, Manchester United vs Celta de Vigo, Everton vs Watford, and Olympique Lyon vs Ajax, all matches provided from our live soccer game pages.